We live in a Stephen Hawking age, but for some the creative, cosmic and spiritual worlds are still places of mystery and innocence. 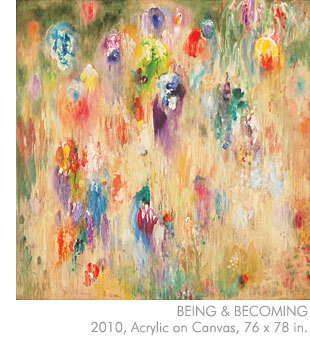 For Paul Fournier, the title of this body of work, “Being and Becoming,” is not incidental to his core beliefs. The man and the artist are inseparable; however, Paul brings us one more element, one often scorned in this other “Age of Irony”, and that is beauty. The sheer beauty of these works is an experience in itself. For me, following the creative process is one of the rare rewards of art dealing. I visit the studio to find Paul in despair over a small passage of paint. We discuss and discuss, and when I return, voila, he has not only resolved the minutiae, he has created a whole new work, creating veils of paint over the past surfaces; this is the magic of a mature artist at work. Paul Fournier, now in his 70s, is a complex person, a mature, resolved artist, a magician of paint and a great example of a 50 year career as an artist, something for which I have the utmost respect and admiration.